Collection from the farm gate may be on either the 23rd or 24th December; as long as it is one of these two days we don't mind which! NEW Opening times: 7:30am - 6:00pm on the 23rd and 7:30am till 3:00pm on the 24th. You may pay by cash, cheque or card. We take no deposit now, full payment is upon collection. All our birds come oven-ready, with relevant cooking instructions, a cooking thermometer (KellyBronze only) and a sturdy carry-home box. Our busiest period is generally between 11:00am and 1:00pm; if you are able to avoid collecting during these times please do so, otherwise we will not keep you waiting for any longer than necessary! Although there is no 'order deadline' certain weights will soon sell out so if you are quite specific as to the size you require please order as early as you are able. Guides as to the size needed for your number of guests will appear on our order form page, however these are a guide only. Please consider your individual guests and your knowledge of their appetites! We will have a full range of chutneys available to purchase on the collection days however we are not taking pre orders for these. 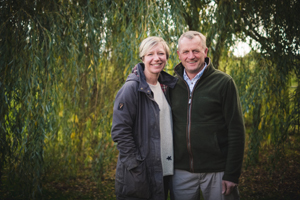 If you have any specific requests or questions do not hesitate to call the office on 01926 843460 where we will be delighted to speak with you. Our full range of products are shown below. Our KellyBronze turkeys are the 'Rolls Royce' of the turkey world. A traditional slow-growing strain which we allow to grow to maturity and therefore to the peak of perfection! They are over twice the age of a standard intensive turkey and it is this maturity which is the main contributory factor to the amazing flavour. 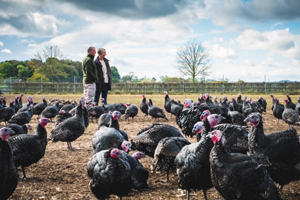 Living free range from mid-summer our KellyBronze turkeys live a 'wild' life, foraging for apples and berries and with a particular taste for nettles! Being fed on a natural diet of corn and soya and with plenty of daily exercise our birds are truly happy birds! All processing takes place on the farm to ensure they are not stressed at any time. In time-honoured tradition our birds are dry plucked, game hung and dry aged for at least 7 (seven) days; these processes result in tender meat. Our free range 'Giant Christmas Cockerels', known as Capons in mainland Europe, are super succulent and suitable to feed large parties. A cockerel makes the perfect alternative to the traditional turkey. We allow them to grow slowly, at a pace that is more natural to them. With a life span of 130 days compared to the average supermarket chicken, which is reared to 38 days, they are grown to maturity resulting in super large sizes and fabulous moist meat. Slow rearing allows the birds to lay down fat, adding to the flavour and succulence when cooking, and when ready to eat, has a concentrated flavour that tastes as chicken should taste. Reared in free range with access to shelter, they have extensive space and room to roam. They are fed on a natural cereal based diet with no artificial additives or growth stimulants being added to their feed. Our Christmas Cockerels are hand-plucked and dry aged in a temperature controlled environment. When is a Capon not a Capon? Caponisation is illegal in the UK but still widely practiced in mainland Europe. Essentially it is a process which can be physical or with hormones, which neuters the cockerel allowing the bird to become plump for the table. We do not caponise our Cockerels. Our rearing method, along with the naturally waning day length during their rearing, means that this practice is totally unnecessary. £TBC/kg, available weights 4 - 6kg. Hatching in early spring our geese spend their life in free range once they have been hardened off. 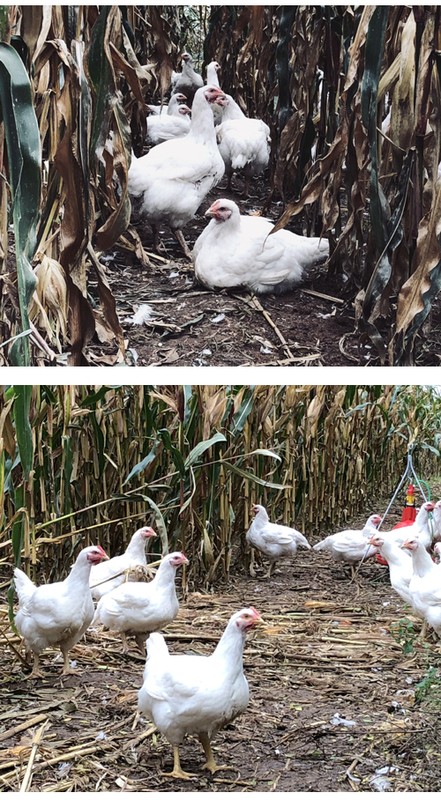 We move them from field to field to ensure a bountiful supply of fresh grass shoots and supplement their insatiable appetite with local wheat and home grown maize (corn on the cob). Their noisy chatter and male squabbling becomes a background melody to every day life on the farm and a sure sign that Christmas is coming. 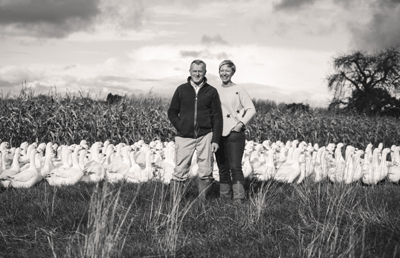 As the traditional choice for the Christmas table geese are the only seasonal birds available today and are the cornerstone of the traditional Christmas dinner. Your goose will come in a sturdy carry home box with full cooking instructions and its giblets wrapped separately. The fat produced during cooking is renowned for producing the best roast potatoes and any surplus can be frozen for use during the year. We are often asked 'What size goose should I get for ... people?' Always a difficult question to answer as we all eat different quantities. However, we offer a guide but please consider your individual guests and your knowledge of their appetites! 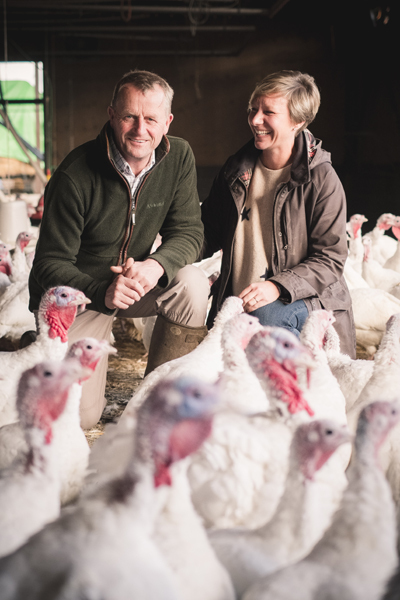 Reared and produced with the greatest care we produce these turkeys to the highest welfare standards. They are fed on a cereal-based diet, housed in buildings with plenty of space, ventilation and light and bedded on comfortable straw. Although called 'Barn Reared' we allow our white turkeys room to wander from within the stables to outside space. This provides interest for them during daylight hours with extra space to move around of their own free will. Even a heavy rain shower doesn't send them running back for cover!! Our Peking ducks grow slowly to reach enormous weights for the festive table. Highly acclaimed by those who look to cook something different, and saving the fat will transform your roast potatoes! Treat yourself to our 'new' Crispy Duck Celebration box. 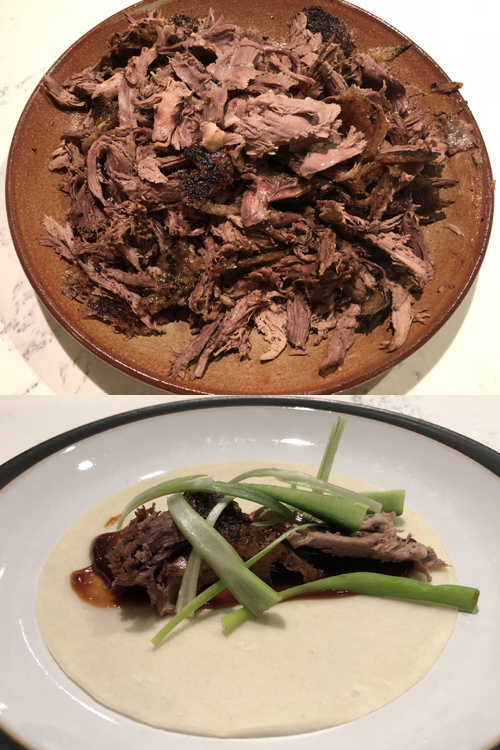 All you need to re-create the classic and delicious Crispy Duck Pancakes in your own home. So easy to do but with that real 'wow' factor. Contents: 1 x 3-4kg Heart of England Farms Duck, 1 x sachet of duck seasoning, 1 x jar of Hoisin sauce, 4 x packets (6 per packet) of pancakes. All you need to complete this meal are some fresh spring onions and cucumber. New for 2018, genuine Melton Mowbray Pork Pies. 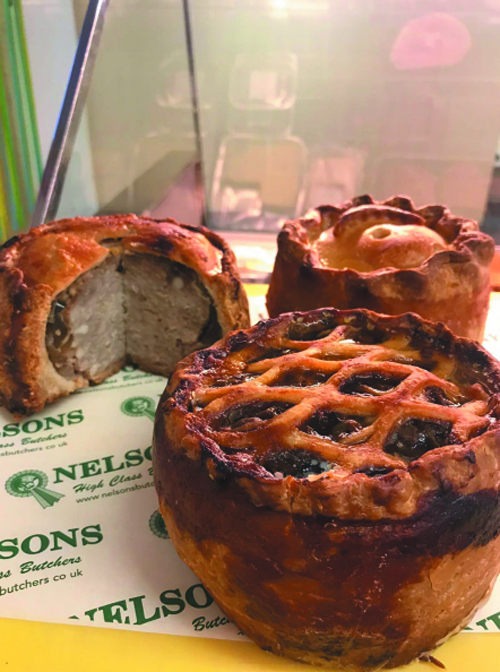 Made in Stamford by Nelson's Butchers (founder members of the Melton Mowbray Pork Pie Association), these fabulous pork pies are hand raised from rich hot water pastry filled with the finest cuts of coarsely chopped free range pork, seasoned with salt and pepper, and crisply baked. Nelson's Festive Pie is made with their beautiful rich hot water pastry and filled with turkey, ham and cranberries. 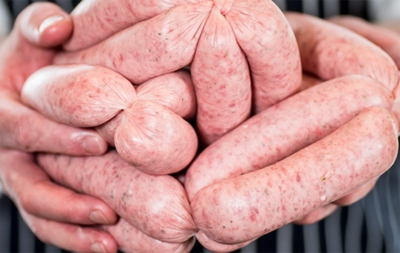 All produced in house by Robbie using free range Blythburgh pork meat.